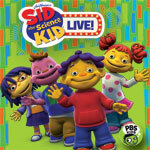 The popular PBS KIDS® television show, Sid the Science Kid, is coming to the live stage. Sid the Science Kid LIVE! will be at The Pullo Center January 24, 2015 at 2:00 & 4:30 p.m. Tickets go on sale May 23 at 10:00 a.m., and can be purchased at ThePulloCenter.com, 717-505-8900 and the Pullo Center Box Office. Pullo Center members can order now. Tickets are $39, $30, or $20 plus applicable service charges. “Sid the Science Kid” comes to life in this incredible live stage experience! Kids and parents alike will be thrilled as Sid, May, Gabriela and Gerald come to town to discover the excitement and curiosities of the world around them. With wonders to discover, Sid and his friends set off on a day of excitement and adventure, as they explore their five senses through fun games and experiments and by asking curious questions and finding fascinating answers. Teacher Susie is also along to keep the music flowing as the kids explore the world around them with audience interactive activities, cooperative problem solving and plenty of laughs to go around. There is even a surprise sixth sense revealed by Teacher Susie. Sid The Science Kid Live! will have the whole family cheering, exploring, dancing and excited to figure out more about the great unknown together. Sid The Science Kid LIVE! is created for the stage by the imaginative minds of Michael Lewis (veteran Broadway performer and producer of ImaginOcean), John Tartaglia (creator and writer of ImaginOcean and Tony Award-nominated actor), and The Jim Henson Company. The Sid the Science Kid television series is an educational animated show produced by The Jim Henson Company for PBS KIDS®. It uses comedy and music to promote exploration, discovery and science readiness among preschoolers. This landmark production of 66 half-hour episodes debuted on September 1, 2008, and has since been honored with five EMMY nominations and multiple awards including the most recent CINE Golden Eagle Award.